It looked like old man winter wanted to spoil our fun for a while but he’s let go of his grip here recently and the trout bite has really turned on. 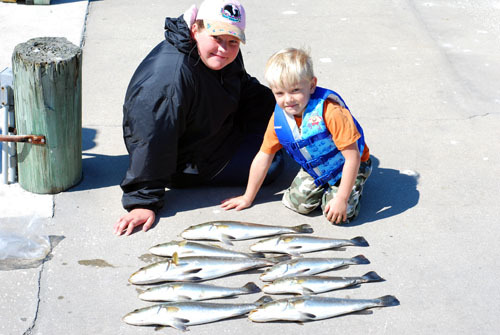 Fish from 15-26″ (1-6 lbs) have come in the boat and they’ve been coming in good numbers. We’ve caught as many as 30 in a single half day trip this week. The trout have been readily taking live shrimp under a cork but the most fun has been catching them on artificial lures such as Mirr-O-Lure soft plastic baits fished either on Slayer Inc. jig heads or Mustad weightless plastic worm hooks. If you’re proficient at throwing lures with spinning tackle, I suspect you could out fish someone throwing live shrimp as the bites have been aggressive on the lures and you can cover more water with them than you can with live shrimp. Redfish are beginning to get back into their normal patterns and we’re seeing several fish each trip. Look for this bite to keep getting better as winter wanes. Don’t forget that tarpon season is just around the corner. Check out this year’s Tarpon Planning Guide and make sure you book early so that you can get the best dates.